Sam Gleaves was on Paradigms in 2015 when he released his CD Ain’t We Brothers. Hot on the heels of that collection we have Sam and Tyler Hughes recording the songs they sing as they’ve been traveling around giving concerts for the past few years. 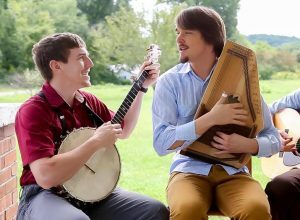 Sam Gleaves & Tyler Hughes is their new CD. Some of the songs will be familiar and some are originals, all written and performed in celebration of Appalachian people and culture.